People either love iguanas for their primitive beauty or hate them as ugly and repulsive. Charles Darwin, who encountered them during his visit to the islands in 1835, described the marine iguana as “a hideous-looking creature, of a dirty black color, stupid, and sluggish in its movements.” Here, a marine iguana swims back to shore on the Galapagos’ Espanola island. 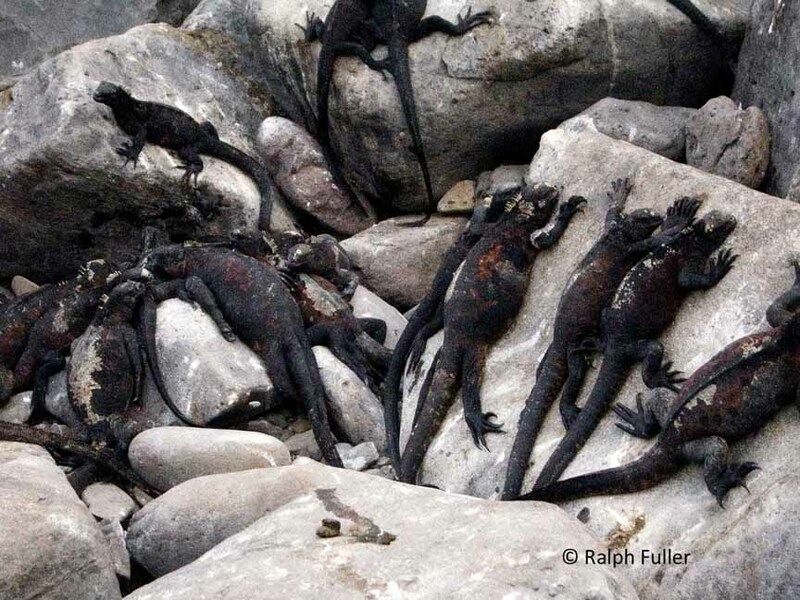 FAMOUS AS THE ONLY LIZARDS THAT SWIM IN THE OCEANS, marine iguanas (Amblyrhynchus cristatus) are found in only one place: the Galapagos Archipelago in the eastern Pacific off Ecuador. There are also three species of non-swimming land iguanas in the Galapagos. All the iguanas in the Galapagos are believed to have descended from a common ancestor that made its way to the islands from South America on rafts of vegetation, with A. cristatus splitting off some 10.5 million years ago. The marine iguanas are found on practically every island in the Galapagos that has a suitable rocky shoreline and access to the sandy areas needed for laying egg nests. Like all iguanas, they are herbaceous – they survive mainly on a diet of algae. In line with the Galapagos’ brand of island-specific evolution, different subspecies inhabit each island, the most apparent differences being in coloration. 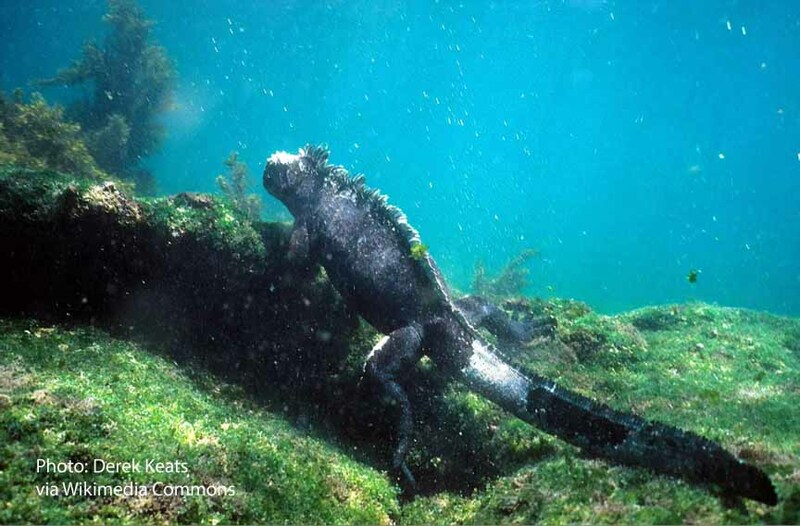 Large male marine iguanas swim offshore to munch on algae on the seabottom. While marine iguanas are renowned for being able to swim away from the coast, hold their breath and dive to depth to graze on algae on the sea bottom, only the larger, stronger males actually do so. Most often, they do dives that last for 10 to 15 minutes and reach depths of 30 feet. But they’ve been clocked at being underwater for as long as an hour, and going much deeper. While the bigger males swim, the females and smaller males stick to land and work the intertidal zones to fulfill their daily herbaceous diet. The result is two distinct behaviors; the off-shore swimmers bask in the sun until mid-day, when their bodies have warmed up sufficiently to endure the wave action and temperatures. The intertidal grazers are stuck with reacting to the ebb and flow of the tides. Because they are cold-blooded, iguanas spend a lot of time spread-eagled on land basking in the sun to warm up their bodies. Once they are warmed, they avoid overheating by assuming an “elevated basking” position facing the sun to lessen surface exposure and raising the front half of their bodies. We tend to see algae as green, fleshy, messy stuff that covers everything. Marine iguanas don’t eat that. They actually eat varieties of short red or green algae – less than one centimeter high – that aren’t readily obvious to our eyes. As opposed to land iguanas, A. cristatus has evolved short, blunt noses useful for grazing on this rock-based algae. Basically, their legs are useless in the water and they swim with their flattened tails, like a fish. On the on the other hand, their feet have sharp claws, useful for climbing on rocks. 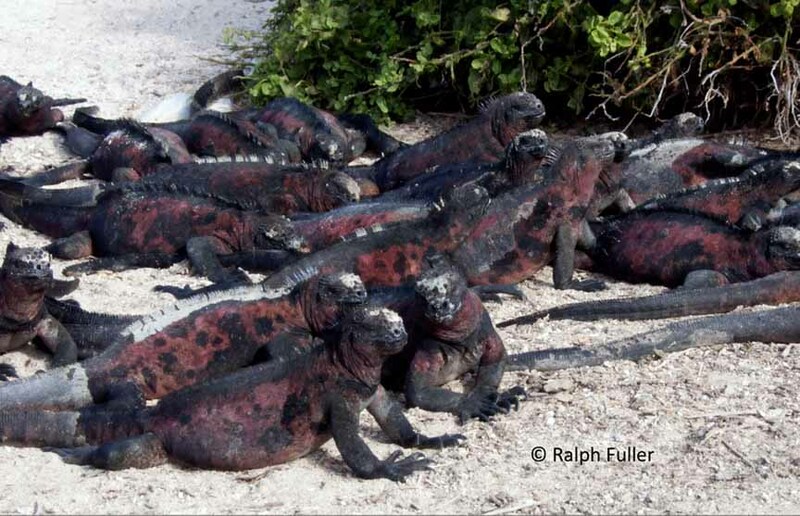 Since the salt in saltwater can be toxic, Galapagos marine iguanas have evolved a special gland connected to the nostrils that allows them to expel salt from their bodies by “sneezing.” The faces of both male and females can appear lighter in color – from encrustation by this salt. Once warmed up, they control their body temperature by lifting the front halves of their bodies off the surface. Guarding their large harems against rivals during mating season, large males often bob their heads as threatening gestures or fight with each other. A “fight” consists of two males putting their heads against each other and pushing. After mating, females find suitable nesting spots in sandy areas, dig a burrow and lay one to four eggs, which take several months to hatch. They guard them for several days to make sure other females don’t try to use the space for their own nests and then abandon them. Hatchlings resemble miniature adults. A hatchling that makes it into adulthood can live 50 years or more. Galapagos iguanas don’t have many natural predators in the water but on land are preyed on by snakes and birds. On many of the islands they are seriously threatened by introduced mammals, including rats, feral cats and dogs. Breeding and invader-control programs have succeeded in restoring populations on several islands but overall the problem is not considered resolved. PRINCIPAL SOURCES: Galapagos, A Natural History, Michael H. Jackson, University of Calgary Press; “Iguanas and Lizards,” Galapagos Conservatory;“Marine Iguanas,” Cornell University.